In celebration of the 15th anniversary of the McKinleyville Press, Editor Jack Durham looks back on the newspaper’s history in a four-part series. Last week he wrote about his desperate attempt to sell the paper in 2008. Here is the final installment, for now. – Ed. I maintain that whales bring good luck. That was certainly true in the summer of 2008. During the last week of July, I saw grey whales off our coast almost every day for a week. They were spouting at the mouth of the Mad River. They were swimming around Trinidad Bay. I hardly ever see whales, but that week was different. It was phenomenal. The week after seeing the whales, I took my first true vacation (six days in a row) since starting the paper in 1996. Courtesy of my parents, I flew to Glacier Bay, Alaska, where I met up with my family. I saw calving glaciers. There were bald eagles and grizzly bears. I was dazzled by the beauty, but that was just the beginning. A month later, Cupid’s arrow pierced my heart when I met Kim Allen. I fell head over heels for her right away. This was the woman I would marry. I was elated! I was madly in love with a wonderful woman, and I finally had control of the newspaper. I also had a lot of things to learn. There was an entire side of the business that I had never handled before – the books, banking, billing and deliveries to all the racks and retail locations (Before I only delivered to a few locations). Overnight what had been two jobs at the newspaper became one job, and it was all mine. On my first full day of having sole control over the McKinleyville Press, I woke up at 4:30 a.m. to get started. I had a lot of things to figure out. Looking over the books and bank statements, I quickly figured out that things were in total disarray. The entire business side of the newspaper needed to be restructured. She became my Assistant Editor and helped me out for the next year and a half. Karol was exactly what the paper needed at the time. Up until I met Kim, my main priority in life was the newspaper. I used to labor 60 to 70 hours a week on it. For years I skipped family events, celebrations and even funerals. “Sorry, I’ve got a newspaper to put out,” I’d say. I had found the perfect woman, so things were going to be different. My main priority was to woo her, spoil her as much as possible and convince her to marry me. This wasn’t going to happen if I ran the newspaper like I had before. I wanted the paper to be part of my life, but not my entire life. So my Assistant Editor and I held several margarita-fueled strategy sessions at the Six Rivers Brewery. We came up with work plans and schedules. I changed my duties at the paper. As much as I enjoyed being a reporter, I was going to have to shift my responsibilities. I would serve as the managing editor, publisher, ad salesman, bookkeeper and delivery guy. My main job, from then on, was to keep the paper alive. When I look at the back issues of the paper from this period of time, I can sense a little more vitality on the pages. They’re more colorful. There’s more warmth. I learned to be more focused and efficient, which allowed me to come to work, get my job done, and come home at a reasonable hour. This allowed me to focus on my most important project – Kim. Kim and I were really hitting it off, and having lots of fun. It was during this period that I started to take a little time off to go camping and explore the great outdoors – for the first time in over a decade. The Press, however, was still for sale. Although I didn’t want to get rid of it, I felt I had to if I were to ever take a real, multi-week vacation. That may sound selfish, but you only live once, and I want to see the world. There are so many places to go and so many things to do. Less than a year after meeting Kim, I popped the question and she said yes. We planned a wedding at Moonstone Beach, but what about a honeymoon? I had a newspaper to put out. It was time to get creative. I sat down with the folks at Western Web and asked for their help. The plan was that I’d get writers and people in the community to provide me with as much material in advance as possible, I would take in-depth features, opinion columns and photos and assemble six pages of each edition spanning a period of three weeks – all before I left on my honeymoon. It was a lot of work, and a lot to ask from my writers, but it got done. The folks over at Western Web offered to help me out. They would assemble the rest of each week’s edition while I was gone. They would get it printed and delivered to the post office. Karol would deliver the paper to all the racks and retail locations. Everything was set to go. On Nov, 14, 2009, Kim and I got married at Moonstone Beach. The next day I went to work putting out a newspaper. After the paper was put to bed, we jumped on an airplane to Italy. For three weeks, the McKinleyville Press was out of my hands. If a problem arose, there was nothing I could do. We went to Rome, Naples, Herculea, Pompeii and Amalfi. We made our way down the boot and crossed the Straits of Messina to Sicily. 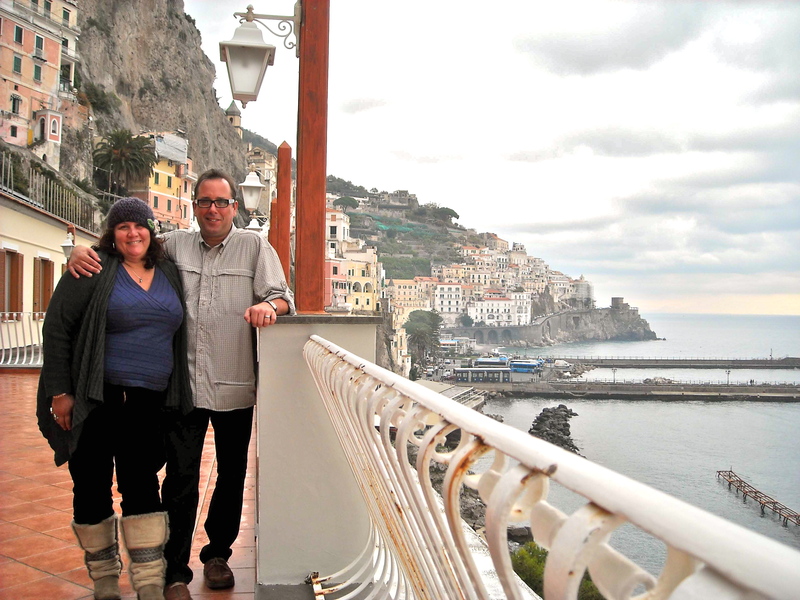 We traveled to Palermo, then rented a car and drove straight through the center of Sicily. We saw the towns where my wife’s great-grandparents came from, then made our way to the Valley of Temples, then flew back to Rome. We visited the Vatican and, on our last day, saw the Pope at the Spanish Steps. It was an amazing trip, and when we returned the McKinleyville Press was still alive. Now that I had discovered I could run the newspaper and occasionally sneak away to take a vacation, I lost interest in selling it. Eventually, the listing expired. Months later someone called and asked about buying the McKinleyville Press. “Thank you for your interest, but it’s not for sale,” I told the caller. One of the things that amazed me in Italy was the small scale of local businesses. I knew that there would be lots of little shops, but I assumed that was just the facade for tourists. Somewhere, further back in each town, there had to be a Safeway or a Wal-Mart, right? Not that I could tell. Everywhere we went, the shops were tiny. They made Roger’s Market in McKinleyville look like a Costco. A hardware store in Amalfi was the size of my office, maybe smaller. They do things on a smaller scale, and that seems to work. Maybe constantly trying to be bigger, and constantly trying to grow, isn’t the way to go. That thought certainly occurred to me more and more over the last couple of years as I studied the nuts and bolts of the McKinleyville Press. Trying to make the paper bigger and bigger as I had in years past didn’t really work, and I had the numbers to prove it. There’s nothing wrong with being a small newspaper, I thought to myself. Print the paper that you can afford to print. Just keep it going, and keep it honest. Be creative. Try to cover as much news as you can. Have fun. This entry was posted on Sunday, August 28th, 2011 at 8:07 am	and is filed under Opinion, Community, Media. You can follow any responses to this entry through the RSS 2.0 feed.